Dawn Enterprises new “Aqueous” self watering planters look terrific and are the perfect low-maintenance solution for any planting project indoors or outdoors. Save big $$$ on shipping costs without sacrificing that upscale, permanent appearance. 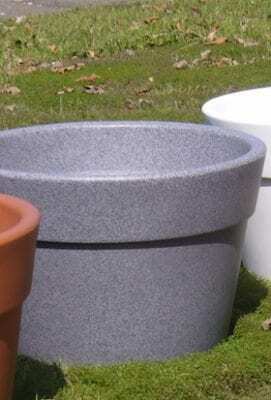 This planter ships at a weight of 13 pounds, yet weighs 300 pounds after planting! Create an attractive perimeter to your property without worrying about a huge freight bill; or losing your new planter to inclement weather. Homeowners, property managers, architects, engineers, landscapers, restaurants, convenience stores, retailers, etc. will love the variety of colors offered (If you’re going for a traditional Terra-Cotta planter, look no further!). * Rotationally molded high density polyethylene with UV inhibitors. * Dual overfill prevention allows excess water to escape the planter and prevents “swamping” or overwatering. * Bottom drain allows quick emptying for transport and/or storage. * Large capped, central fill system allows quick and easy set up. * Reservoir and base feature reinforcing ribs to add strength for larger and heavier root balls. * Wicking/evaporation system makes the planter self-watering and allows weeks and weeks of maintenance-free plant/flower growth. * Size optimized for maximum shipping value and efficiency. By now you are thinking the Aqueous is perfect, but hang on…it’s “green” and eco-friendly too! Each time the plant is watered by rain or hand, the built-in reservoir captures every bit your plant/s don’t need and holds it; effectively reducing overall water consumption. Also, all raw material used in manufacturing is 100% recyclable #4 HDPE.